Home - Uniscan Walkers Ltd. The walking frame specialist. Our office and factory will be closed from 12.30pm on Friday, December 21st 2018 and will re-open at 8.30am on Thursday, January 3rd 2019. A sincere thank you to all our customers and we look forward to supplying your requirements throughout 2019. Wishing you a happy Christmas and a prosperous New Year from everyone at Uniscan. A walking frame (rollator) can be a real help for anyone who has trouble with their mobility, no matter what their age. This site gives you all the information you require, not only about our 4-leg and 3-leg walkers/rollators, but why a mobility aid could really improve your life or that of someone you care about. Click for our Guide to Walkers. We hope that you find our site useful and easy to navigate, but if you have any questions about our products or services please do not hesitate to contact us. We know that there are lots of other walkers available, but Uniscan are unique in that we design and manufacture all our walking frames at our factory in Essex, UK. 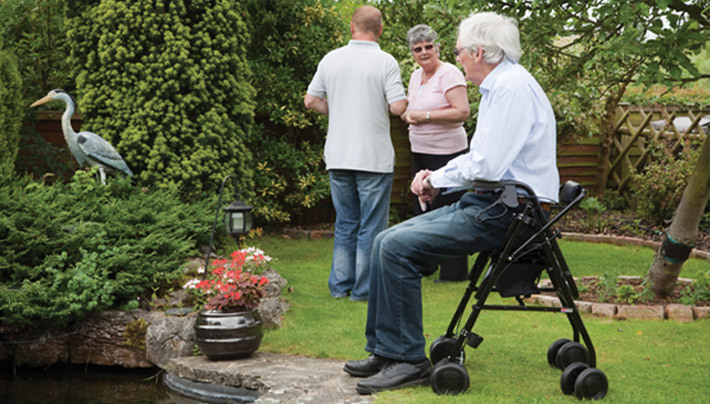 We manufacture our walkers to be ultra lightweight, which is critical to the young, people with limited strength or those with debilitating conditions such as arthritis or MS etc. Six 4-leg walkers/rollators all with built-in rest seat. Two 3-leg walkers both with a built-in rest seat. A Single Handed bar accessory which can be fitted to most of our 4-leg walkers. This accessory allows people to use a Uniscan walker if they have use of only one arm following a stroke or amputation etc. Please read through the pages, request a brochure, call and ask any questions you may still have. If you are still not convinced about a Uniscan, please compare other walkers against ours; then you will know why “Nothing Similar is Quite the Same”.